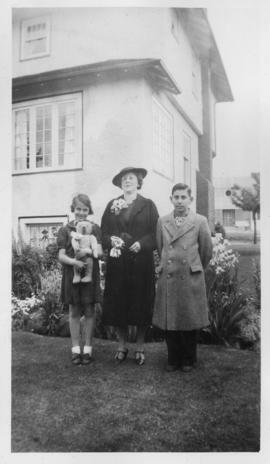 Photograph of Rose Soskin with children Ted and Helen (and teddy bear). 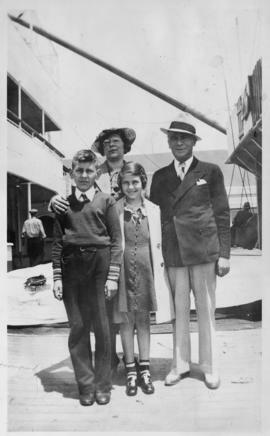 Photograph of Rose, Ted and Helen Soskin with family friend Phil Brotman. Photograph of Helen and Ted Soskin taken in approximately 1933. Black and white reproduction of a portrait of the Cullum family. The handwriting on the verso reads 'Crops of pumpkins squash and vegetable marrows grown at Sewall on Q.C. Is. by Unsworth Children. "Stamp on front reads "MAR 60". Handwriting on the verso reads "Betty, David + Elaine Unsworth Easter morning 1957 at Sewall, Q.C. Is. P.O. Port Clements, B.C.Stamp on front reads "SEP 58"